Yamaha has just launched a new variant in the Cygnus Ray ZR automatic scooter line-up. Called the Street Rally, the new variant is a sportier version of the Yamaha Ray ZR automatic scooter. Changes are mainly aesthetic though, and the engine has remained untouched. The scooter is priced at Rs. 57,898, ex-showroom, Delhi. Talking of the various changes in the Yamaha Ray ZR Street Rally, the automatic scooter gets a new bikini fairing on the front handlebar, knuckle guards and a new front mudguard that’s adjustable. However, the tyres haven’t been changed to off-road spec or on-off road units, which means that the changes on the Ray ZR ‘Street Rally’ is more cosmetic than off-road performance oriented. The scooter is available in two colours: Rally Red and Racing Blue. The engine and other cycle parts remain similar to the other variants of the Yamaha Ray ZR sold in India. The engine is a 110-cc four stroke, single-cylinder unit with 7.1 Bhp of peak power and 8.1 Nm of peak torque. In terms of outright horsepower, this motor lags behind the 110-cc four-stroke engine of the Honda Activa and the rest of the 110-cc automatic scooters sold in India. However, the Yamaha Ray ZR’s relatively light kerb weight of 105 kilograms does mean that performance is more than adequate for everyday use. A CVT automatic transmission is standard on this scooter. Claimed mileage is an impressive 66 Kmpl. Telescopic front forks and a monoshock rear make for suspension, while the front wheel gets a 170-mm disc brake. The rear wheel gets a drum brake. Alloy wheels and tubeless tyres are standard. 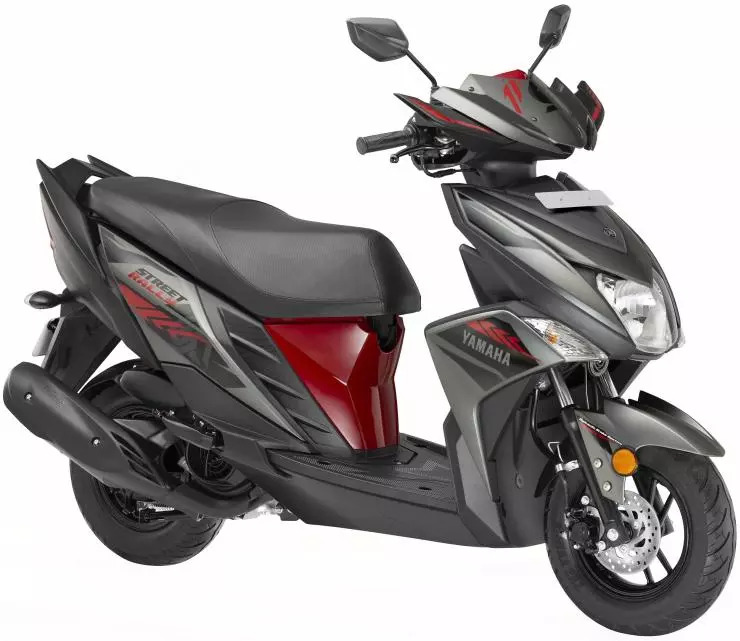 The Yamaha Ray ZR range of automatic scooters are targeted at younger buyers who want a sharp looking scooter that’s fun to ride.